It’s a cheat day! Peter and Carl take a break from the heavy lifting and snack on some ranting. The topic this time is mansplaining! Join Peter and Carl as they react to their interview with Sonya Renee Taylor and try to figure out this radical self-love thing. Join Peter and Carl as the interview Sonya Renee Taylor, the author of The Body is Not an Apology. She’s incredible and helps Peter and Carl figure out how radical self-love can be an awesome process for men exercising social justice. Join Peter and Carl as they talk about the Black Pill community. Although the Black Pill is on the extreme side of masculinity, what are the lessons we can learn about ourselves from the men in this community. They’re joined by a surprise guest! 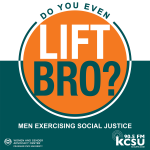 Tune in to find out why it’s important for us to keep an eye on these groups as a way for men to exercise social justice. We’re back for season 4! Join Peter and Carl as they dive into the importance of understanding the dynamics of white supremacy in our everyday lives. They will be using two different articles to talk directly about how thinking intersectionally about systems of oppression is a necessary component to men exercising social justice.